On November 19th 2015 Hoffman Bikes embarked on an epic 43 day online countdown heading towards this, their 25th anniversary in BMX. We've picked 10 of our favourite DIG moments from that history as seen through their eyes during those 43 days. The final post was the image above of Mat breaking his own high air record at the 'Holy Grail' of 43 years old, and after almost 25 years. Absolutely Incredible. Enjoy these picks from all that they've produced and created and then head over to the Hoffman site or Facebook page to see lots more of their indelible marks on BMX history. "In the early 90s, a new breed of BMX rider emerged. These riders had more than BMX riding on their minds, they also pushed product design. Chad Harrington was one of those riders. Chad’s dirt jumping style, which can be seen in his breakout video part in Eddie Roman’s “Ride On” video, made waves throughout the BMX community. 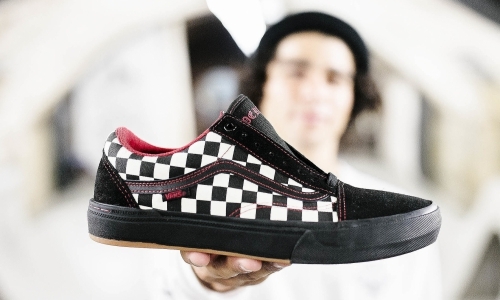 Chad was not only known for his riding, but was also known as product designer. After joining Hoffman bikes in late 1992, Chad put his product designs to the test by helping design several Hoffman Bikes products. One of the well-known products Chad is known for developing would be Hoffman Bikes’ first clamp-stem, which would be later paired with the Super Forks. Chad’s time on Hoffman Bikes helped push product design to new levels, not only for Hoffman Bikes, but for the entire industry." Jay’s progressive style and ability to ride anything took the Hoffman Bikes team to a whole new level." "One of Mat’s inspirations growing up was Evel Knievel. We all can agree that Evel was a pioneer and paved the way for everyone in action sports. After meeting Evel Knievel in 1996, Mat and Evel became great friends. In 1997, Mat wanted to pay homage to this legend by producing one-of-a-kind limited edition Evel Knievel complete bikes and framesets. In 1998, Hoffman Bikes introduced the first of 2 models. The first Evel Knievel complete bike and frameset was released in 1998. It featured a unique frame design with a decal set to match. Hoffman Bikes also paid tribute to Evel Knievel in the 1998 X Games by providing the 1998 team with special Evel Knievel inspired team jerseys and custom frames, painted white with Evel Knievel decals. In 1999, Hoffman Bikes released the 2nd edition Evel Knievel complete bike and frameset to honor his Wembley Stadium jump. The Wembley Stadium limited edition release featured a new frame design along with a decal and colorway that represented Evel Knievel and the UK. It’s a GREAT honor to have Evel Knievel a part of the Hoffman Bikes history. Head over to hoffmanbikes.com for exclusive photo gallery." "Plucked up by Stuart Dawkins from Seventies (HB UK Distributor at the time), we knew that Sebastian “Bas” Keep was going to be something great. In early 2001, Seventies added Sebastian to the Hoffman Bikes UK team. From an early age, Sebastian’s riding set him apart from everyone else. When he put his mind to it, Sebastian did it, regardless if it was Dirt, Street, Vert, Mega Ramps or taking a hike out to the middle of nowhere to create something never thought of before and set records using a mountain as a huge dirt quarter-pipe. This is just one of the many things that would have never happened in BMX without Bas. 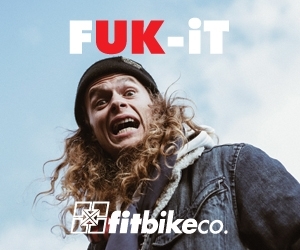 Sebastian is what Hoffman Bikes is. Doing what you love and doing it on your own terms. It is a true honor to be able to have Sebastian Keep’s name etched in the long list of riders who made Hoffman Bikes what it is." Music: Q and Not U "X-Polynation"
"For a brand or rider to earn a cover shot on a printed magazine is an achievement in itself. Over the course of nearly 25 years, Hoffman Bikes product and team riders have raked up an impressive 48 magazine covers that span across a multitude of magazines like RIDE bmx , Ride UK BMX , Bmx Plus, Freedom Bmx, DIG BMX Magazine and more. Printed magazines falling victim to the digital era makes the 48 covers that much more special. 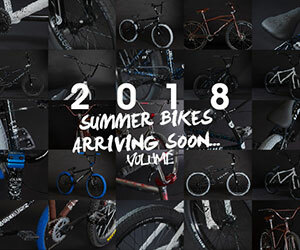 Head over to hoffmanbikes.com and take a walk down memory lane and enjoy Bmx Magazine covers that feature Hoffman Bikes products and riders like Mat Hoffman, Kevin Robinson, Dave Mirra, Jay Miron, Mike "Rooftop" Escamilla, Taj Mihelich, Joe “Butcher” Kowalski, Day Smith and Davin “Psycho” Hallford, just to name a few." 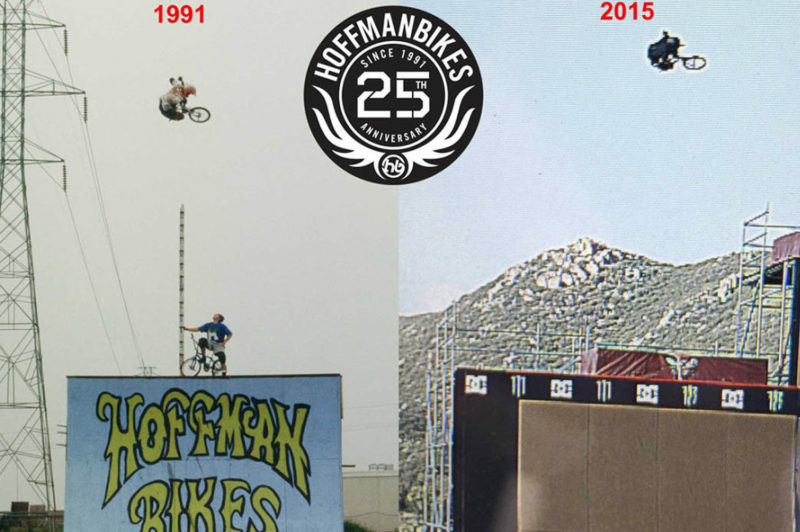 23 Days until Hoffman Bikes 25th AnniversaryMat Hoffman first met Mike "Rooftop" Escamilla at one of the original BS contests in OKC in 1994, where he earned his nickname. The legend goes, Mike was a young kid who talked the whole long drive from California, so he almost got strapped to the roof of the car if he didn’t shut up. Unbeknownst to his fellow passengers, he would redefine that name with his legacy of original style and innovation that would make our sport greater. By late 1995, Mike Escamilla and Hoffman Bikes joined forces. Mike blazed his own path and showed that you don’t have to do the same tricks as everyone and inspired originality. Mike is also known for doing some of the first big gaps. In December 1995, he scored his first interview and cover on his first Hoffman Bike doing the roof to flat gap in issue 19 of Ride BMX. Mike was always looking for new equipment that could help him advance his riding. During Mike’s years with Hoffman Bikes, we produced several proto-types for him. One of those designs was this custom bashguard added to his bike.Head over to hoffmanbikes.com for extened video and read Mikes Ridebmx plus interview and see the bashguard proto-type frame. "Mat Hoffman first met Mike "Rooftop" Escamilla at one of the original BS contests in OKC in 1994, where he earned his nickname. The legend goes, Mike was a young kid who talked the whole long drive from California, so he almost got strapped to the roof of the car if he didn’t shut up. Unbeknownst to his fellow passengers, he would redefine that name with his legacy of original style and innovation that would make our sport greater. By late 1995, Mike Escamilla and Hoffman Bikes joined forces. Mike blazed his own path and showed that you don’t have to do the same tricks as everyone and inspired originality. 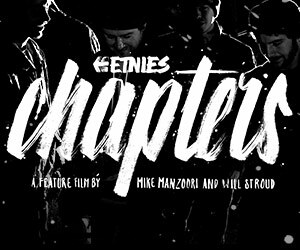 Mike is also known for doing some of the first big gaps. In December 1995, he scored his first interview and cover on his first Hoffman Bike doing the roof to flat gap in issue 19 of Ride BMX. Mike was always looking for new equipment that could help him advance his riding. During Mike’s years with Hoffman Bikes, we produced several proto-types for him. One of those designs was this custom bashguard added to his bike." Head over to hoffmanbikes.com for extended video and see the bashguard proto-type frame. "One of the most influential BMX street riders ever: Seth Kimbrough. August 1998, Seth and a group of friends piled in a car and made the trip to Oceanside, CA, for the BS (Bicycle Stunt) Contest. Little did Hoffman Bikes know that this young BMX rider from Hartselle, AL, would be one of Hoffman Bikes iconic riders. Less than one week after that contest, Mike “Big Island” Castillo got the thumbs up to call Seth to see if he would like to join the team. Needless to say, there was a package shipped that day. Since then, Seth continues to push himself and Hoffman Bikes to be the best. May it be riding, filming and designing products like the 2002 “Instrument” frame and the current “Bama” frame, fork and bars line. Seth is a one-of-a-kind rider. His ability to look at an obstacle, something simple like a curb, and turn it into a video part was unheard of. Here we are 17 years, 3 months and roughly 28 days later, Seth’s passion and his drive continues make him who he was, is and will be. What more can we say.. Truly Honored! " Head over to Hoffman website to enjoy a 3 minute extended edit along with a exclusive photo gallery. 11 Days until Hoffman Bikes 25th AnniversaryThe late 90’s ushered in a new breed of street rider. With product designs stronger, it allowed riders to progress street riding to a whole new level. In Bethlehem, PA, there were a small group of these riders and Joe “Butcher” Kowalski was one of them.Joe, like others in the Bethlehem, PA crew, did not just focus on street, but was also known to put time in at the trails. It did not matter what Joe touched, he destroyed it. Joe pushed street riding to and over the edge at times, being noted as one of the first to do variation grinds, like the barspin grinds and perfecting other street variations like crack flips in and out of grinds, mega drops, grinding on both sides. Joe was also one of the first to bring his street/trails knowledge to the competition arena, helping shape how riders compete in contests. From CFBs to X Games, the way riders looked at runs changed.In 1996, Joe brought his influence to the Hoffman Bikes team and also helped shape new product designs, which led to his Butcher Signature Frame and Pro Level complete bike. What an honor to have such an influential rider representing Hoffman Bikes and family for life.Hit up hoffmanbikes.com for extended edit and a short Q&A and photo gallery. enjoy. http://hoffmanbikes.com/11-days-joe-butcher-kowalski/Music: BiohazardThanks to Props BMX and Sandy Carson Photography for providing some of the video and photos. "The late 90’s ushered in a new breed of street rider. With product designs stronger, it allowed riders to progress street riding to a whole new level. In Bethlehem, PA, there were a small group of these riders and Joe “Butcher” Kowalski was one of them. Joe, like others in the Bethlehem, PA crew, did not just focus on street, but was also known to put time in at the trails. It did not matter what Joe touched, he destroyed it. Joe pushed street riding to and over the edge at times, being noted as one of the first to do variation grinds, like the barspin grinds and perfecting other street variations like crack flips in and out of grinds, mega drops, grinding on both sides. Joe was also one of the first to bring his street/trails knowledge to the competition arena, helping shape how riders compete in contests. From CFBs to X Games, the way riders looked at runs changed. In 1996, Joe brought his influence to the Hoffman Bikes team and also helped shape new product designs, which led to his Butcher Signature Frame and Pro Level complete bike. What an honor to have such an influential rider representing Hoffman Bikes and family for life." Hit up hoffmanbikes.com for extended edit and a short Q&A and photo gallery. enjoy. Thanks to Props BMX and Sandy Carson Photography for providing some of the video and photos. — with Joe Butcher Kowalski. "What do you think of when you think of Taj Mihelich? Style. Taj re defined supermans, tailwhips and everything else he did. He was a Game Changer to style. Taj brought something new to the bmx that Bmx really needed. He made riding an art. His unique style of riding brought a whole new era of stylecats. More known for trails riding, Taj quickly made his mark in the park, street and, yes, even the vert scene. It's an honor, to say Taj was a Hoffman Bikes Team Rider!" 42 Days until Hoffman Bikes 25th AnniversaryToday, we celebrate Team Rider No. 1, Mat Hoffman. The OG of all the Hoffman Team OGs. Before 1991, Mat Hoffman was already pushing the limits. Starting Hoffman Bikes allowed Mat to push BMX riding and product design to a whole new level - for everyone. We thank you Mat Hoffman for being a driving force in making BMX what it is today!Check out the Mat Hoffman Photo Galleryhttp://hoffmanbikes.com/mat-hoffman-og-team/Footage provided by Eddie Roman | "Ride On" VideoMusic: Jawbreaker "Parabola"
"Today, we celebrate Team Rider No. 1, Mat Hoffman. The OG of all the Hoffman Team OGs. Before 1991, Mat Hoffman was already pushing the limits. Starting Hoffman Bikes allowed Mat to push BMX riding and product design to a whole new level - for everyone. We thank you Mat Hoffman for being a driving force in making BMX what it is today!" A new DVD keeping that old school feeling alive! One of our favourite new videos this year!